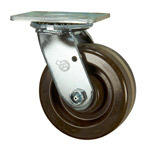 Select Service Caster Corporation casters and wheels for use in high temperatures. 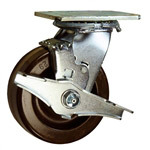 Heat resistant caster applications include: lighter weight bakery caster, autoclave wheels, powder coat room casters, rolling oven rack wheels, bakery rack casters. 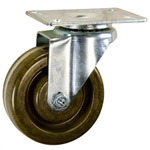 Remember, you must consider the proper lubricant for your application. 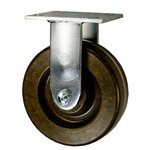 For more options, pricing and availability, please call our West Reading, PA, office at 1-800-215-8220. 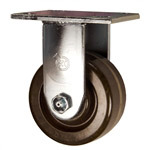 4" x 2" Rigid Caster - High Temperature Phenolic Wheel - 800 Lbs Cap. 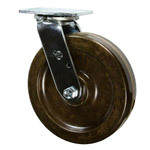 4" Swivel Caster - High Temperature Phenolic Wheel - 800 Lbs Cap. 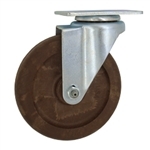 5" x 2" Rigid Caster High Temperature Phenolic Wheel - 1,000 Lbs Cap. 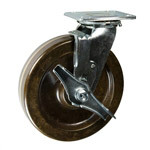 6" Rigid Caster High Temperature Phenolic Wheel - 1,200 Lbs Cap. 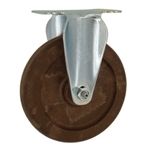 8" Rigid Caster High Temperature Phenolic Wheel - 1,250 Lbs Cap. 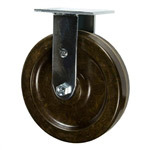 8" x 2" Swivel Caster High Temperature Phenolic Wheel - 1,250 Lbs Cap.